Sennheiser SC 75 USB MS Wired Headset is Sennheiser Culture headset that provides dual speaker on both ears and offers users dual connectivity, 3.5 mm jack and USB connectivity. 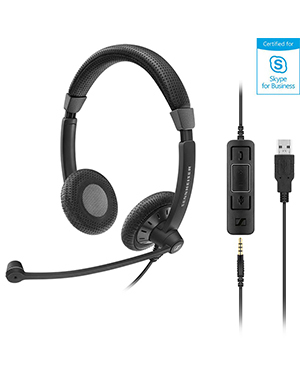 Certified for Skype for Business, the headset is ideal for professional usage, especially for those users who need to manage calls throughout several devices, including PCs, smartphones, and tablets. With a contemporary style, Sennheiser SC 75 USB MS Wired Headset is structured with a good-looking design that can be perfect for offices, lobbies, and front-desks. This creates a great professional impression in offices and workplaces. And what’s even more important is that it offers incredible sound quality together with outstanding comfort. The top-notch sound quality helps in improving productivity through better and crystal clear conversations while the outstanding comfort will allow users to wear the headset and be able to work for an entire day with ease. Give Headsetsonline a call through Australia wide 1300 131 133 in order to learn more about this headset today! Sennheiser was founded in June 1, 1945, right after the end of the World War II. The company was created by Dr. Fritz Sennheiser along with 7 other University of Hannover electrical engineers. It was known as Laboratorium Wennebostel or Lab W in the past, with the company being moved to the village of Wennebostel after the war. It was renamed though as Sennheiser Electronics in 1958. Sennheiser started out with the development of a voltmeter. After that, the company has focused on building microphones, from noise-compensated to transformers. It even further expanded its product portfolio to geophysical equipment, mixers, and miniature magnetic headphones. The company was even responsible for introducing and releasing the first open headphones of the world in the year 1968. Sennheiser has undergone through a lot of changes throughout the decades. It entered the aviation market and joined in the development of modern wireless microphones. It was even awarded with the 59th Academy Awards.